Still life with beer, wheat and hops. opening a brew pub, and enjoying beer. Welcome back. Today we are talking about attributes of a favored craft brewery. There are a number of things that cause people to choose a brew pub or craft brewery over another restaurant option. It’s important to be cognizant as to the reasons why people choose a brew pub. 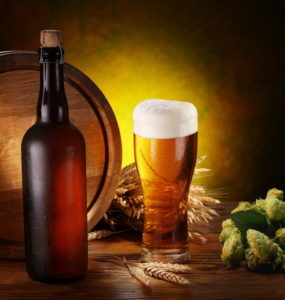 In the first, among these issues, or attributes really, that are important for a craft brewery to be a really favorable one, and a favorable experience for their guests, has to do with the environment that the brew pub is in. You want a place that is welcoming. You want a place that is consistent, both in terms of the look, the feel, what kind of dÃ©cor you choose to go with. I think a lot of breweries are kind of going to a rustic, laid back feel, maybe painted in colors that favor people sticking around, having multiple pints. The environment is something that’s important to think through, if you are working on opening up a restaurant or a bar or a craft brewery, because that consistency in look and feel is part of what makes a bar, a restaurant, a craft brewery inviting to people and it’s what will help them. It’s only one attribute. We have several, but it is one attribute that will bring people back. Next attribute of a favored craft brewery. I actually think this one is the most important attribute that you could have for your brew pub, which is service. I cannot tell you the number of places, even some local, where I think the service is just terrible. It’s all about the beer. The individuals who own and operate those places, they are very passionate about the beers that they’re making, but the service, and being mindful of the customer service, is something that tends to be very lacking at certain breweries. It’s a shame because of that, because it’s hard enough when you are a brew pub, when there are four to five thousand other breweries in the United States now to stand out from the crowd. Environments tend to be very similar across the board, you know, maybe different colors of paint, maybe different little things here and there in terms of how it looks. But what is going to sell your beer consistently, and is going to keep people coming back to your location, and is going to get them talking to their friends, talking to the other people at the office about what a great brewery this is, is the service that they receive. Again, this is one of those things that drives me a little bit nuts with the growing taproom movement, where we have our food truck come out, and then we have just beer service inside. Number one, I got to go outside to get to the food truck. That’s a little bit frustrating in most cases. Another thing that is frustrating about that, is that, often times, the table service is not nearly as good as it could be. Part of that is, absolutely, it’s a cost savings on the part of the bar and brew pub. I’ve looked at the numbers too. It’s hard to make things work as a restaurant. You really, really have to watch and manage those numbers closely, otherwise you’re going to go into the red really fast, because one of your big expenses, really it’s about a third of your overall sales, or at least that’s the objective, is people. It’s labor. That really can get out of hand in a hurry for a brew pub. The answer to that is cutting back the number of employees you have, giving them more tables, and going to a more casual, fast-casual pub, bar kind of atmosphere, that I’ve got to make the effort, sometimes, to get my next beer. I don’t have somebody being mindful of what I’m drinking, what I’m eating, as I do in a full-service restaurant. I get the idea of not having a lot of servers, but at the same time, if you’re not having those servers really help with selling your beer, you’re leaving a lot of money on the table. That pulls it around to the ownership side, away from the customer side, but on the customer side, most customers would like to have somebody who’s going to be aware, and mindful, and making sure that their beers are replaced before their glasses go empty. I’ve always considered that a major faux pas if a server is so unaware of what’s going on at their tables that my beer goes empty. I’m not the only one who believes that. It can impact tips that way. I don’t hit somebody on tips if they are not being quite as mindful. The reason why I don’t do it, is because a lot of those servers are making very … having trouble just getting by. They tend to … especially depending on how their shift is going, they’re making either a lot of money, or maybe not much money at all. For younger population, which constitutes a lot of the servers, that can be real tough. I was there back in the day making very, very little, and having all sorts of expenses, and it’s challenging. Along those lines, and this is another really important attribute for a brew pub specifically, is a diversity of beers. You don’t want to have two or three beers for the most part. There’s places that get away with it. Heady Topper is the one place that … They’ve got their one beer and that one beer is just amazing. For the most part, you cannot get away with that. There’s a lot of beers that are amazing beers out there, and you have to really be thinking about having enough diversity in your beers that it’s going to be attractive to a beer fan to come out and to come back. You want to have that diversity of beers, but you also want to make sure that your beer menu changes over, just like your food menu changes over. Something to think about there. Along those same lines, the beer pairings with food. Now that is huge. If you are a tap room that is relying upon food trucks, I disagree with that mindset. I disagree with that model. I think it’s a model that is the “in” thing right now, but I think it’s going to have a lot of problems for a lot of these tap rooms down the road, because at the end of the day, people want consistency. Why is McDonald’s the biggest chain of fast food restaurants in the world? It’s not because they have great food. It’s because every time I go to a McDonald’s, I know exactly what I’m going to get. Shifting that over to the craft beer side of things, I need to know, every time I go in, the kind of food I can expect. I want to have some specialty items that could show up on the menu every now and then, but I want something that’s consistent, somethings reliable, something that I can depend on. That’s true on the beer side. If I’m a regular guest at a brewery, usually there’s that go-to beer that I have. If that go-to beer isn’t on the menu, I’m not staying as long. I might still order a beer, because, hey, I’m already there, but I’m not going to stay as long as I otherwise would, and I’m not going to spend as much. It hurts the experience. Make sure you have your food consistent and your beer consistent and you’ll be well on your way to the attributes of a favored craft brewery. We may come up back around to this to other attributes that are great as well, include making sure you have excellent entertainment available. That’s not necessarily bands, but it should be an experience when you go out to a brew pub. Anyway, that’s all I have to say for right now. Thanks for listening and have a fabulous day.